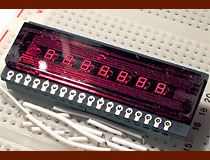 The NSA578 is an example of the next step in display evolution after single digit displays like the MAN-1, as it incorporates all seven segments into a single die. Such displays were popular for early pocket calculators and watches, where the small size of the numerals did not cause a hindrance to operation. The NSA578 contains seven digits, each whole digit is etched on a single die, and soldered to a standard PCB backing. 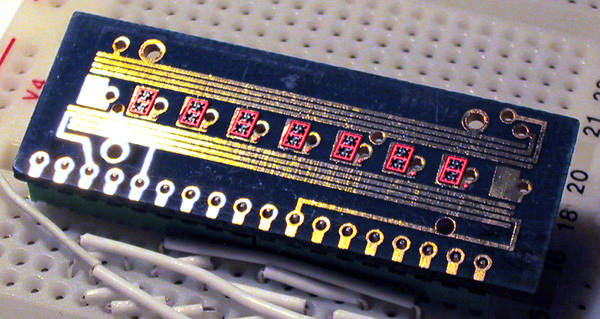 The dies' leads are connected to tracks on the PCB by fine wires, similar to the die connections used in most semiconductor chips. 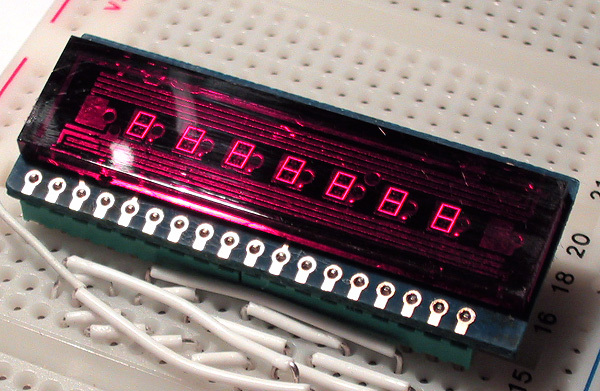 The display's decimal points are separate dies, each with their own PCB pad and connecting wire. Due to the small size of single-die digits, most such assemblies used an external magnifier to make the digits more readable. The NSA758 is unusual in that it does not have an external magnifier. Instead, a red plastic cover is the only barrier between the dies and the outside world. Here is an image of the display with the cover removed, which reveals the single-die digits. The NSA578 activated to show digits. Image with cover removed, showing individual digit wafers.